So which Trump was right? The stock market’s current valuation is on the higher-end of historical averages, but nowhere near bubble territory. And while the stock market has risen 16% since the election, this year’s rally has been marked by a clear “bet” against Trump and his policies, made stronger by each day of dysfunction in his administration. The original “Trump Trade”– the belief immediately following the election that the President would spur stronger economic growth through tax cuts and deregulation-has all but completely evaporated. The chart below shows the key policy themes of a Trump Presidency, along with the accompanying “trade” made by the market after his election. 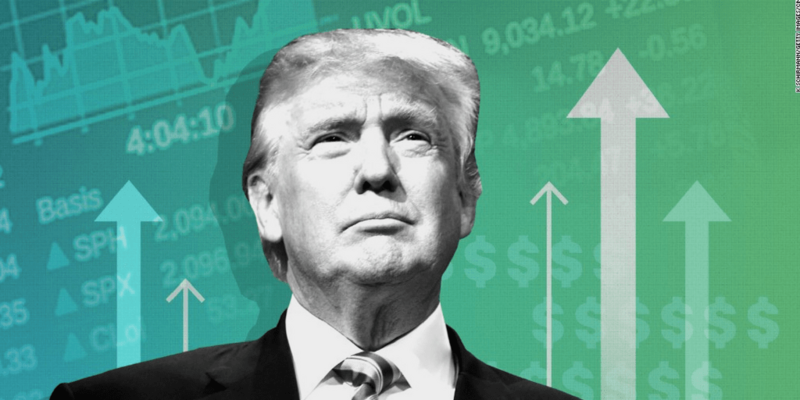 While Trump’s impact on the market was clear in the 1st month after his election, the market has since moved strongly in the opposite direction. So, if not Trump, what is driving the market higher? We believe the market’s rally is predominantly due to improving company fundamentals, with nearly three out of four S&P 500 companies beating earnings estimates in the latest quarter. While fiscal policy changes could still move stock prices higher, the market assigns little to no probability that Trump will get anything done.